The terms "bread improver," "dough enhancer" and "dough conditioner" all refer to the same product: a combination of acids, emulsifiers and enzymes that feed yeast and restructure gluten to retain carbon dioxide more effectively. A bread improver helps form a light, airy crumb without sacrificing its "chew" or "toothiness." Don't use a bread improver unless it's needed. If you have trouble with dense breads, or difficulty rolling out dough, that's when you'd want to try a bread improver. Or, if you like sandwich bread with a soft, kid-friendly crust, try a bread improver. If you're happy with your bread as it is, don't use it. 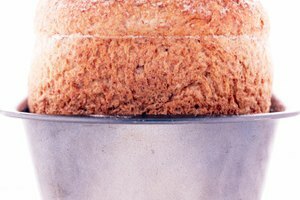 Despite its advantages, keep in mind that a bread improver is useless unless you're using the proper bread-making technique and portioning your ingredients accurately. The main disadvantage of a bread improver is how it can affect the bread's crust. Just as the improver inhibits toughening of the crumb, it has the same effect on the crust, giving it a bit of chew, so it's unlike the hearty crusts that homemade breads typically have. 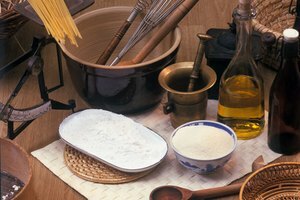 Bread improvers often contain soya flour, a natural bleaching agent. Breads made with this type of improver will appear whiter than breads made without. Measure 1 to 2 tablespoons of improver for every 3 cups of flour. If you've never used a bread improver, start with 1 tablespoon to gauge its effects -- and use more next time if you feel it's necessary. Use 1 to 1 1/2 tablespoons of improver for bread and 2 tablespoons of improver for baked goods you roll out such as pizza dough. Add 1/3 of the improver to the measuring cup, and then spoon in the flour. Pour the flour and improver into a mixing bowl. Add another 1/3 of the improver to the measuring cup followed by the flour, and then pour it into the mixing bowl. Repeat with the last cup of flour. Whisk the flour to combine and make the bread according to the recipe. There are different bread improvers for different breads. 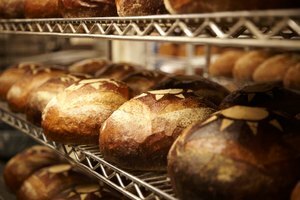 You can find improvers for rye, whole-grain and regular bread at baking supply stores, online and most supermarkets.